Underneath a shaded pergola, our communal barbecue area is an ideal outdoor space for group meals or celebrations. Complete with barbecues & utensils, tables & chairs and connected to power, this delightful outdoor room allows everyone to enjoy the bushy surrounds of Surf Coast Cabins. Our large multipurpose room at 50 square meters is a versatile space that can be set up for a variety of interest groups including book clubs, talks, meetings, yoga and social events. Opening onto a large deck & dining space, groups can enjoy the serene bush setting. It is the perfect yoga space, with its peaceful outlook onto our native garden. This spacious room is carpeted, air-conditioned and equipped with a large TV monitor & Wi-Fi. Removable table and chairs are available to seat up to 20 people comfortably. 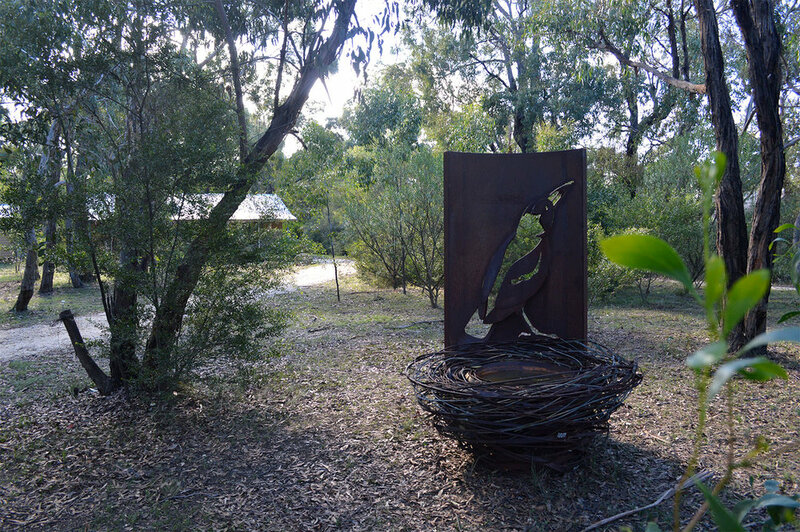 Surf Coast Cabins is set on 6000m2 of native gardens and eucalypts. Wander our gardens and discover sculptures and artworks tucked away in hidden corners. Sit on a seat in the leafy surrounds, and spot our many birds. Our cottages are situated in a very quiet part of Aireys inlet within walking distance of the township and a variety of coastal or bush walks.